It's easy to put something in the refrigerator and forget about it. ShopSmart consulted a panel of experts to determine which foods could be spoiling by just sitting in the fridge. Freeman says it's not always the best idea to rely on labels. Some foods don't have them, and the ones on others can be confusing. Also, most people don't realize that once they open certain popular items found in containers or cans, a new freshness clock starts ticking. So, it's important to know which foods have a shorter lifespan once placed in the fridge. If items that have been sitting in the fridge too long are eaten, they can lead to food poisoning and, in some cases, serious health problems. An open jar of strained fruits and veggies lasts two-to-three days in the fridge. Opened cooked meat and vegetable combos need to go after a day or two. Meat and veggie combos should go after two days, tops. The bottom line: Don't leave open jars of baby food in the fridge longer than three days. A hidden danger with baby food is that parents may feed babies right out of the jar, so saliva transferred to the jar can promote bacterial growth when placed back in the fridge. If you're using a jar more than once, make sure you portion out what you're going to use, so the dirty spoon doesn't go back into the jar. Once opened, tomato-based sauces are only good for five days to a week. Don't wait for the mold to form. In many cases, you won't see the mold in the sauce after five days, but it actually could be there. Some mold produce toxins that can be harmful, so why take the risk? Mold grows in very wet environments. What promotes the mold is the high moisture content. No amount of cooking will kill the toxins. So, to be safe, you need to throw it away. Mayo has a high fat content, which means it's not as susceptible to mold and bacteria growth. 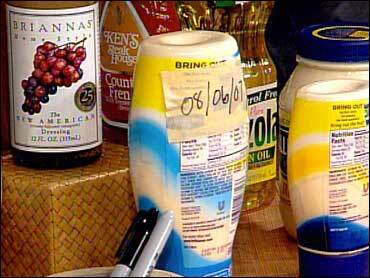 But the oils in mayo break down over time, so its flavor changes, and it will no longer taste good. There may be a subtle "off" smell, but you may or may not be able to smell it, so be on the safe side and dispose of it after two months, no matter what type of container it comes in. For other condiments, such as ketchup, oil, and salad dressing, refer to the expiration dates, which are normally accurate for these products. Because it's not always easy to keep track of how long your food has been living in the fridge, Freeman suggests taking tape and a marker and writing down the date you open any glass jars or metal cans. Use the dates as your reference point. Once you've gone past the date, it is time to trash it! Softer cheeses generally have a shorter shelf-life than hard chesses. Hard cheeses ( e.g. cheddar or Swiss) last three to four weeks in the fridge after they're opened; soft cheeses (e.g. Brie) last one week. With cheeses, you can follow the "use/sell by" dates as your guide, but it's best to examine the cheese: Look for mold and smell the cheese to see if it has an odor of ammonia. It's possible to prolong cheese's shelf life before you store it in the fridge: Remove the plastic that firm cheeses often come in, and wrap the cheese in wax paper. Finish it off with a light layer of plastic wrap. It's also still possible to eat cheese that has mold on it, but you must be careful: Cut off an inch beyond the mold on all sides, keeping the knife clean between cuts, so you won't spread it. Re-cover it with some fresh wrap. Eggs should last three to five weeks after you put them in the fridge. Keep in mind that it's very important that you don't put eggs in the front of the fridge — even if there are compartments for them there. They'll spoil earlier if they're in the front. Stick eggs along with milk, and raw food (fish, meat, and poultry) in the back of the fridge, because it's cooler there. Bacteria grow at a slower rate in colder temperatures. The back of the fridge is typically the coldest part of your fridge, so store items there that need to be kept freshest. Butter is good to keep in the front of the fridge, to keep it warmer so it's easy to cut. Butter, bottled water, and other unopened drinks are items that are less susceptible to temperature problems. Kung Pao chicken, pepperoni pizza, or tuna salad must go in the fridge within two hours of serving to reduce your risk of food-borne illnesses, because bacteria grow more quickly at room temperature. Don't leave leftovers hanging out in the kitchen. Put them in the fridge as soon as you're done with them. Cold temperatures slow the rate of bacteria growth. For larger items, such as macaroni salad or large quantities of Chinese food, refrigerate in several shallow containers rather than large clumps. That way, the food will cool evenly and more quickly. You don't want a big clump: That risks the chance of something growing in the center because it didn't cool properly.